Is your Business Ready for the Next Wave of Technology? Times they are a-changin’ – and they aren’t slowing down anytime soon. The pace of technology has accelerated greatly in the past ten years, impacting the way we live and how our organizations function. Moore’s law of doubling illustrates why: Every technological advancement serves as a building block for the next and the next, creating rapid technology growth that increases, or “doubles,” exponentially with each passing year. Consider This: In 2004, DARPA issued a self-driving car challenge. The first driverless car to complete a 150 mile route in the Mojave Desert would win $1 million – not one car finished. Carnegie Mellon’s car traveled the farthest, completing only 7.32 miles. Jump ahead to 2017, Google has its own self-driving car company with self-driving Chrysler Pacifica hybrid minivans. Google has clocked more than three million miles. It took Google about six years to hit the first million miles, but the last million took just seven months to achieve. What this story illustrates is the fact that the power of doubling has hit the critical point, where artificial intelligence, the internet of things (IoT), Big Data and Cloud Computing are poised to enable a transformation of the business world as we know it. This next wave of technology is rapidly approaching, and will inevitably reorganize the way our companies work and deliver services, internally and externally. Executives who embrace this next phase of advancement and ready their people, processes and technology will survive and thrive. Those that don’t put their businesses at risk. So, what can you expect and how do you ready your business? With every new development – starting with the first microprocessor in 1958, followed by the internet, the iPhone, the IoT, etc. – we’ve seen an enormous increase in the amount of data that’s produced, especially with unstructured data. 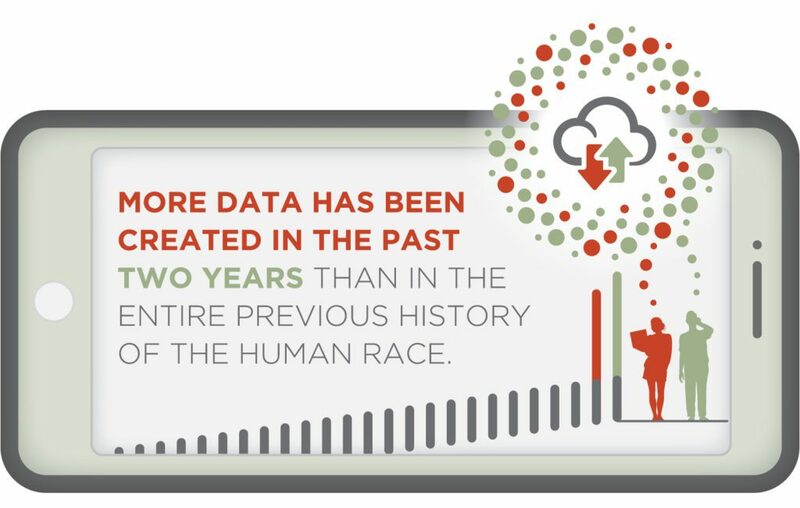 More data has been created in the past two years than in the entire previous history of the human race. (Forbes) The law of doubling is setting up a revolution that by 2020 will radically change the business world to which we’ve become accustomed. Then: Until the last few years, we could easy divide our world into three parts – transactions, decisions and infrastructure. We have transactions, such as buying, selling and paying, which are supported by our ERP systems. For the last 20 years, getting the right ERP system in place to support those transactions has been the focus for many CIOs. After transactions occur, business intelligence (BI) enables us to look at what happened and make better decisions. Supporting both transactions and decisions is our infrastructure. New factors, however, have come into play with the acceleration of technology. Now: Cloud infrastructure provides us the opportunity to reorganize computing power. Applications can be built and scaled in real time, letting organizations respond rapidly to changing customer needs and market opportunities. On the transactional side, we’re now able to extend out our ERP to the cloud through the IoT and applications to reach customers, suppliers and even the very objects that are in the physical world. 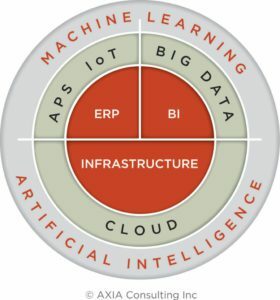 On the decision side, the cloud allows us to extend BI into big data, where we can analyze massive amounts of structured and unstructured data from all facets of the enterprise. What’s to Come: The technologies in place today will fuel further acceleration. Artificial intelligence and machine learning will further extend ERP capabilities through robotic process automation. They will enable analysis of big data to provide far more actionable information than was possible in the past. Robotic Process Automation software will replace many transactional workers for software robots, which will cost about 1/3 the price of an offshore full-time employee or 1/5 the price of an onshore worker. We are looking at a revolution that will be larger than the global shifts that caused the rust belt. Focus on enabling business capability, not rolling out technology. Technology alone will not enable business capability. It’s only when people, processes and technology are combined that business capability can be created. Enable new business capabilities with the technology you already own or with point cloud applications (IoT, Big Data, etc.). Most organizations are only using a fraction of the capabilities of their existing ERP and BI software. Integrate your IT organization with the business to enable the process and people changes that deliver true value. Get out of the world of transactions and focus on transformation. Engage the business in a different, hands-on way with pilots. Begin planning your IT budgets to account for new technology that will transform your data into usable insight. But, make sure you’re investing in the right tools for your business needs. Partner to grow by collaborating with the best minds from inside and outside the organization. As the next wave of technology quickly approaches, organizations must take steps now to ready their people, processes and technology or risk falling behind. Thanks to the law of doubling, technology advancement won’t be slowing down. With eyes wide open and with the right perspective in place, CIOs can position themselves to successfully guide their organizations through this exciting, accelerating journey to a productive future. Gre g Pitstick is AXIA Consulting’s Innovation Practice Lead. 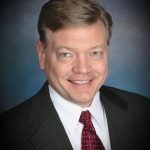 With decades of experience, he has a proven track record of successfully leading global business transformation programs, developing IT strategies and counseling companies on how to best leverage technology to achieve business strategies. Greg focuses on helping organizations achieve synergies through the integration of people, processes and technology.